The following presents the results of an experiment to reconstruct a largely naked human. 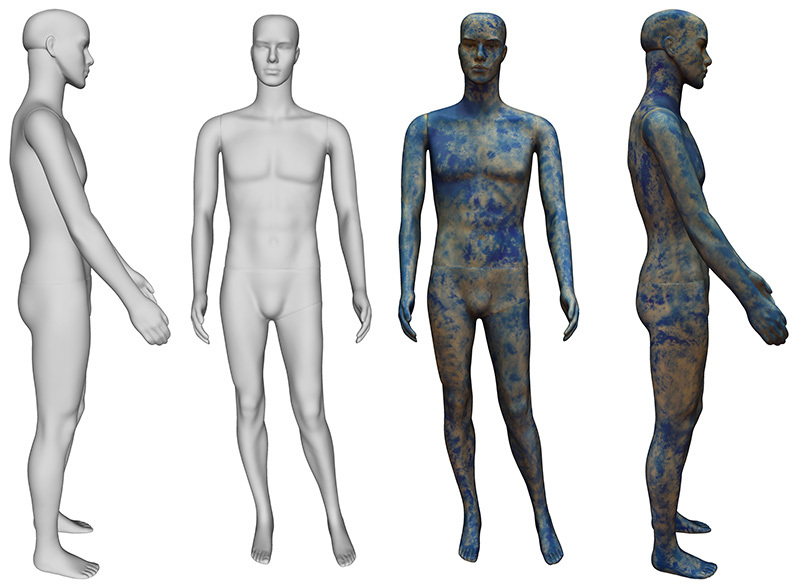 Unlike most scanning processes for humans, there was no need for a textured model. The application was only interested in the geometry of the body in question. The challenge is that for the smooth healthy skin of the young subjects there would be very few feature points, as such the reconstructed models would generally be low quality. In order to test the pipeline under multiple camera scenarios a mannequin was chosen, this had the additional characteristic of being even smoother and glossier than human skin. There are a number of solutions to the lack of feature points, one is to use a data projector to project a pattern onto the model. This is most applicable for subjects that cannot otherwise be interfered with. In this case it was decided to paint the subject with standard body paint. This washes off easily and given the painting pattern used creates a very high resolution random pattern that seemed to be ideally suited to the feature point process. Basically the paint was "dabbed" on by hitting the skin with the end of the bristles, which then randomly flay sideways giving the pattern shown. Prior to applying the paint as described various tests per performed on a piece of PVC piping. This included streaks of paint, it performed much worse than the stipple pattern. Multiple colours were also tested but they seemed to offer no improvement. The following shows the scale bars employed to get a model in real world coordinates. Final reconstructed model is shown below. While the geometric detail is hard to judge from these, it should be noted that the gaps in the waist and arm seams have been resolved and they are on the scale of 1mm. As expected the most challenging areas were under the arms and between the legs. There are three factors contributing to this: those regions have the fewest overlapping images, they are generally darker, and the photographs are generally taken at shearing angles.